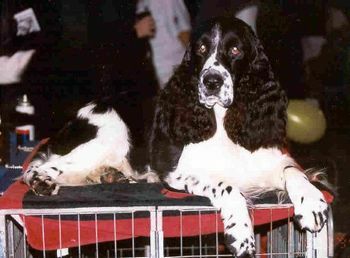 Brady is Australia's FIRST BLACK and WHITE GRAND CHAMPION SPRINGER. He is one of Australia's top winning springers being a multi Best in Show, Specialty Class in Show winner, Best in Group winner. Brady's progeny have been achieving well with many class in shows, Puppy of Breed Melbourne Royal 2001 and Best in Show at ESSAQ March Specialty 2002. Brady passed away at the age of 15 years old and is missed by his family everyday. We may be lucky enough to maybe have another Brady one day.